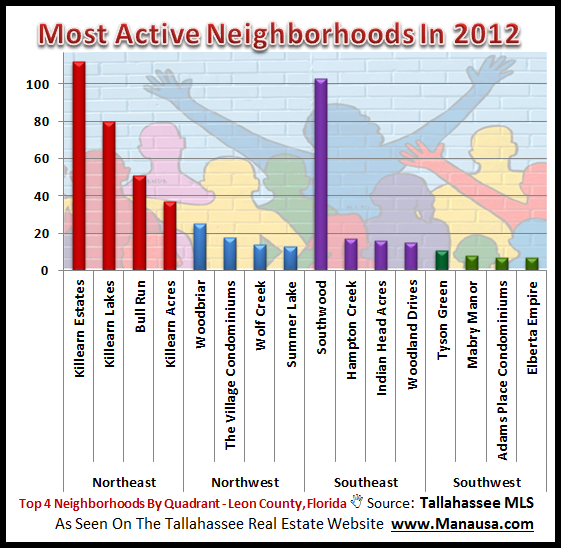 We get many questions relating to the most active Tallahassee neighborhoods, and 2012 produced no big surprises. The northeast quadrant of the Tallahassee real estate market had the most active Tallahassee neighborhoods, with 52% of all home sales being recorded there. When you see what we have assembled, it is obvious where people are choosing to move to right now. We shouldn't be surprised to find the most active Tallahassee neighborhoods are in Northeast Tallahassee, and the following table illustrates the Northeast's dominance. Simply click on the name of each neighborhood for a complete list of homes for sale there. One thing that really pops out to me from the table above is that only 1 of the 18 most active Tallahassee neighborhoods is on the western side of the Tallahassee housing market. This means that if you want to sell a home on the western side of town, you had better utilize the best home selling plan if you want to pull a buyer away from the eastern side of town. When we look at the top subdivisions in Tallahassee by area, the NE dominance stands out. With the exception of Southwood in SE Tallahassee, the northeast quadrant has the majority of the homebuyers' attention right now. I hope this report helps you prepare for your next real estate transaction. Remember, you can subscribe to the Tallahassee Real Estate Blog (just tells us where to send it) for the most updated information on the most active Tallahassee neighborhoods.